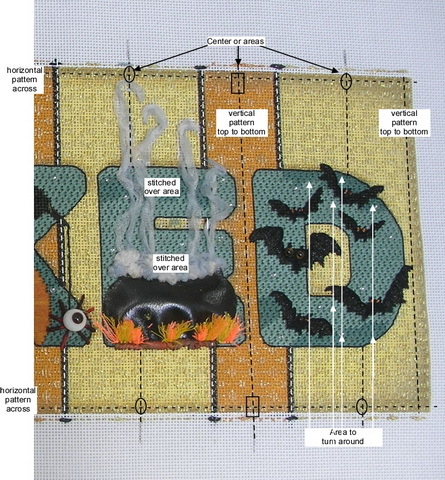 The first thing I did before stitching was to read the stitch guide and refer to the canvas. 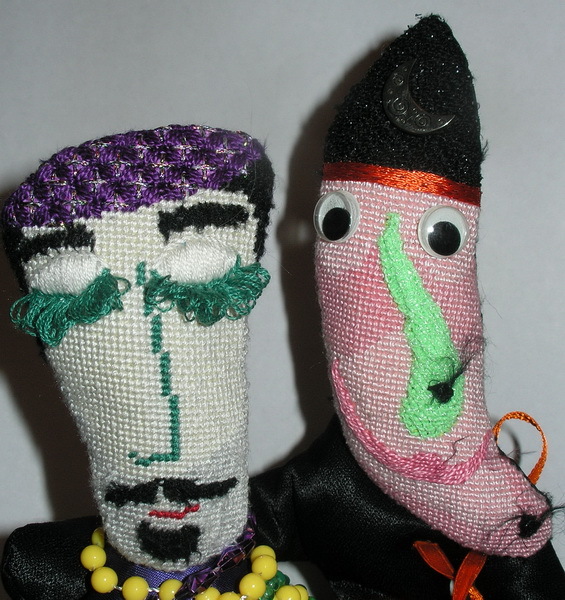 I wanted to be sure I understood everything before I began stitching. As I read I found several things I thought I might have to change but I didn’t make any notes and kept an open mind. I did make notes on things I wanted to remember to do. 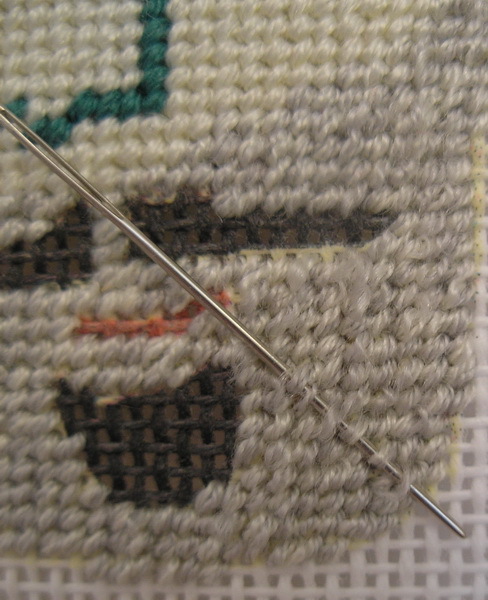 W: I outlined the areas that the stitch guide noted would be outlined. I even made a little asterisk mark at the points of the moon to begin and/or end the outlines here for a crisp point. 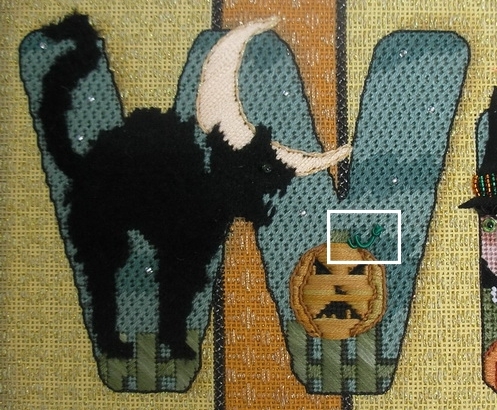 Fangs: I also marked those two stitches on the cat that looked out of place…it took me awhile but after looking at them quite a while I decided they were fangs and not mis-painted canvas. Curly q on pumpkin: stitch guide said to stitch over this area. I: Only the top part of the I was Nobuko stitched. 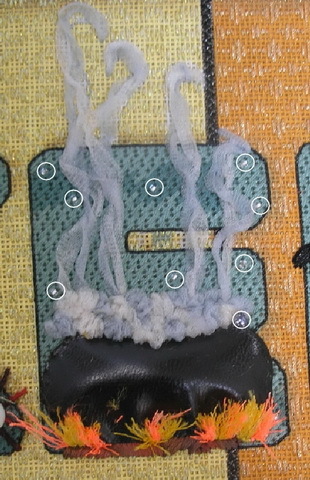 I showed the outline around the letter Nobuko was stitched over petals of flower on hat and over hair. Only the center of the flower was left not stitched in Nobuko. Also made note that skull was last thing on this letter to be stitched. C: was the easiest letter to stitch; everything was stitched and the spider web was to be couched over these stitches later. The letter was also outlined. Outline letter. Another straight forward letter, bats are either Diagonal Gobelin or Basketweave. 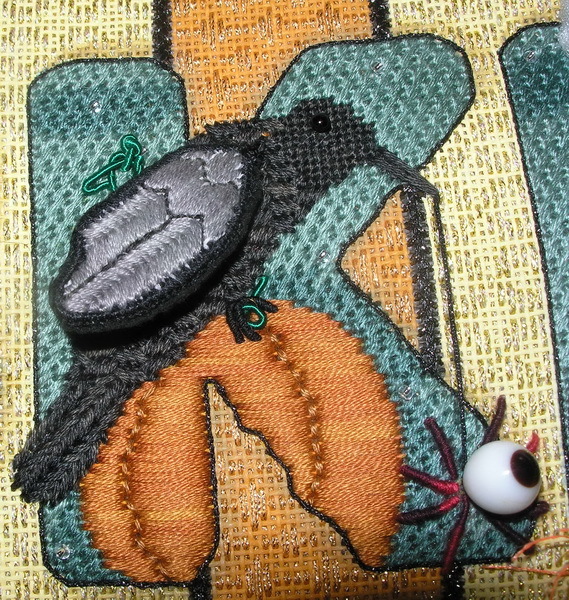 Then I began stitching. Like I said before I was happy that the boring part was being stitched first…not boring but mundane. I always try to stitch some of the background as I go because if you leave it until last it seems like it takes forever! I think it has to do with all the creative stitches have been completed and in your mind you may already be thinking about that next canvas you are going to stitch. Backgrounds can be sooooo mundane and sometimes because of this you will make a mistake and if the background comes around to meet itself it can be off and depending on where it meets can be disastrous. Sometimes if you catch it you can fudge the background and get it to work but if there is a definite horizontal and vertical line it can be difficult. Background: This background had its challenges. I decided to center each area of the yellow and orange backgrounds because there was the black bar between them. 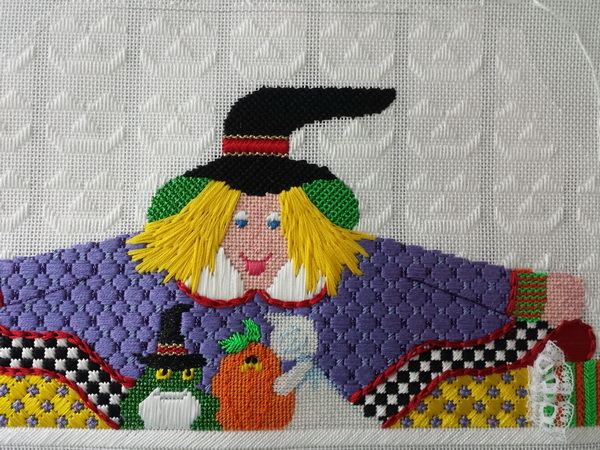 The orange background was the negative stitches of the yellow background, so I wanted the horizontal lines to match up but the vertical lines did not necessarily have to be continuous. The black divider between them would soften this difference. BUT I thought maybe the Black crosses could look off if they weren’t at least somewhat the same. So if you look at the W-I picture you will see a 1 by the third from left black divider; it is the only one that mostly goes from top to bottom. I stitched that one first so the others I could sort of match up to this one when other stitching interrupted the line and the crosses would not be more than a thread off to the eye. I don’t think anyone would have ever noticed but me but I guess that is the …”it might be looked at by a needlework judge”. She will spot the off-ness anyway but at least I tried. And you know what a friend of mine says…. Background stitching: I started in the middle of each section and worked toward the side that would give me a full, top to bottom row. 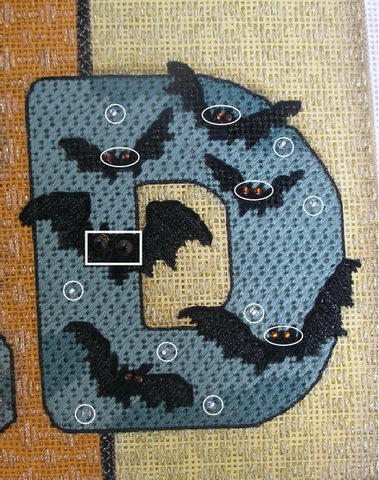 Mostly every letter allowed at least one darning stitch to go from bottom to top and this kept the pattern in line. Also once the vertical line from top to bottom in the first section was established; it also started the horizontal lines across the top and bottom. And once the horizontal and vertical line was established in the yellow areas all the oval places in the picture will be the same stitch in each area. The same is true for the rectangle in the orange areas too. This will help keep the background from going askew before I am finished. Stitching the background around this letter was relatively simple as I either had the Nobuko stitches to turn around or areas that were to be padded, each letter was different. Letter W: The solid white lines show the areas where when not turning a row in the Nobuko of the letter I could do a small turn around stitch or tacking stitch. I tried not to end threads in these areas unless I was sure there was going to be padding. 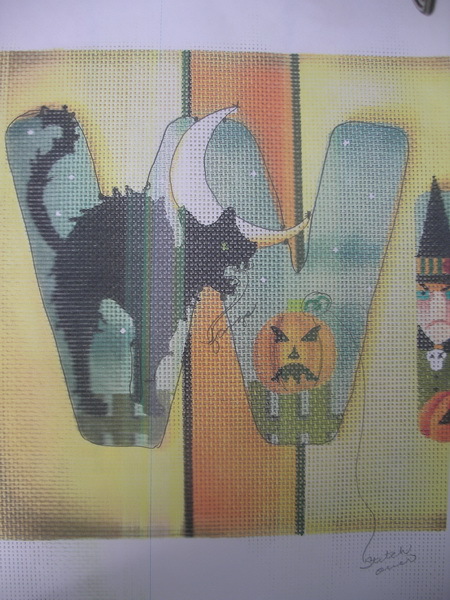 The area by the cat’s tail (upper left) was an area where I first used a traveling stitch, but the other areas by the moon, fence and pumpkin were either padded or I could do a tacking stitch that would be stitched over later. Letter I: The hat is ultra-suede so I could turn rows in this areas and I had stitched most of the top right half of the letter, leaving only the center of the flower unstitched. 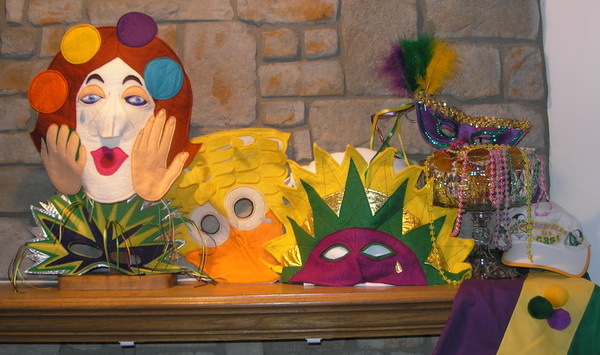 And the bottom was a pumpkin that was to be padded so I had turn around areas here too. 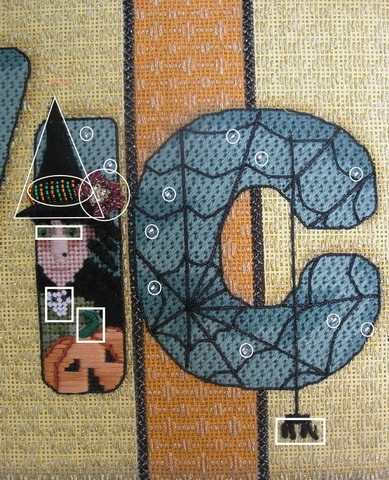 Letter C: This was one of the two easiest letters to stitch; it was all Nobuko and the spider web and spider were couched and stitched over. 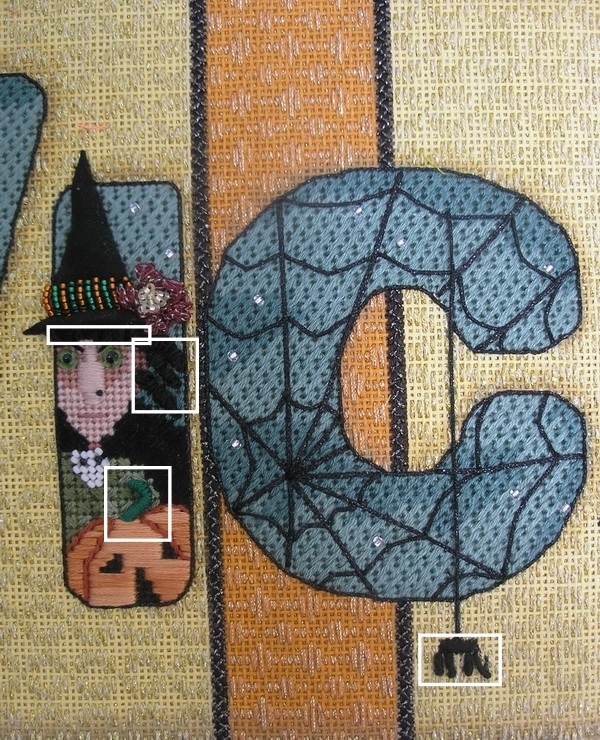 This made turn around/tack stitches easy for the background. Hardest part was the inside of the C background. 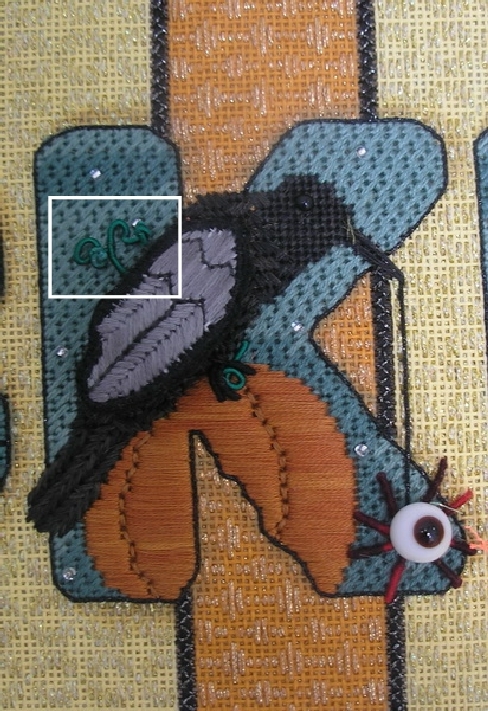 I first stitched from center toward K until I had a full line, then went back and filled in the center of the C.
Letter K: The K didn’t present much of a problem stitching the background as the Nobuko is at the top and bottom of the letter, the pumpkin is padded and the bird body is a Cashmere variation that allows for turn-around stitches. The little bit of orange background in the center right of the K took a bit of maneuvering as not much stitch was on the top of the canvas. Letter E: Since all the steam was stitched first in Nobuko and the pot was an applique, there were plenty of turn-around places for the background. I thought about repainting the mistake in the background but though I could cover with the thread and the steam, so I left it. I see it but I think the canvas has enough stitching interest to keep most people’s eye moving past it. I waited to do the yellow background until after I had stitched the orange between the E & D.
Letter D: Nobuko is pretty straight forward here again. 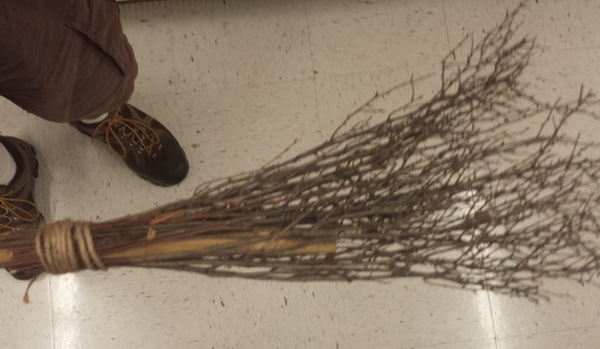 The instructions say the large bats are stitched in diagonal Gobelins and smaller bats are Basketweave. 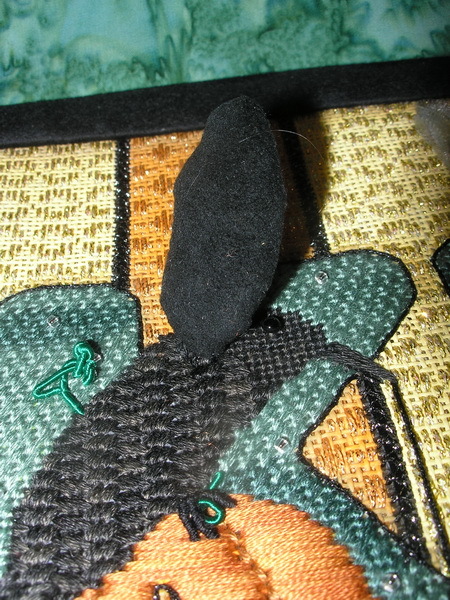 So the top right bat was the only one I felt I needed to drop down below to make a turnaround stitch in Nobuko; the larger bats I could take a small tack stitch in the wing areas. 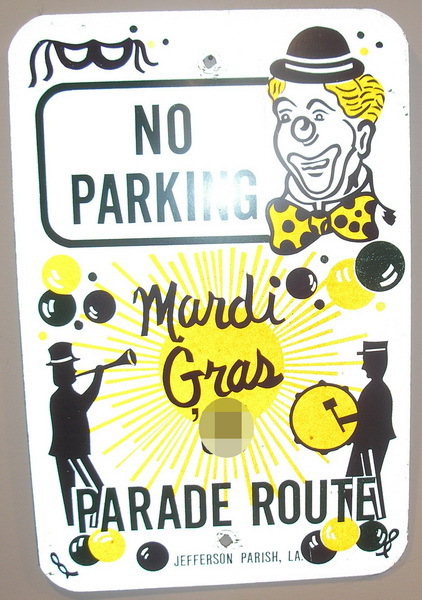 The biggest problem was lining up the yellow background inside the D.
There are only three places where you have a top to bottom vertical line to keep the pattern established: to the left of the E in yellow background; the center line of the orange area, and the far right of the D. So you have to stitch background yellow center to the left and establish line on the E and center to the right to establish vertical line on the right of the D. The orange is the center line. Once the background and letters were in the fun began and again I started with the W and worked to the D. Here was where I made a few more “sudu” changes. Remember, needlepoint has to be fun or don’t do it. I will usually try a new technique, stitch or thread but if it becomes frustrating to me or I don’t like it, I stop and take it out and find something that works for me. Next time I’ll tell you about the design elements of each letter. If you have any questions, just ask in the comment area and I will try and answer them. Promised we would add some needlepoint in here…and then I got behind last week and of course the blog is the first to go. I really wish I could write ahead and have several posts ready to go. I’ve just never been very good at that; maybe I’ll try again. Most of my stitching is either a geometric counted pieces or I am designing my own original pieces so a painted canvas with a stitch guide is a rarity for me until this past year. This past year I have done at least three or four with stitch guides and several even had thread kits. BUT not one of them is stitched exactly like the stitch guide was written; sometimes I wasn’t happy with the chosen thread and other times I chose a different stitch. 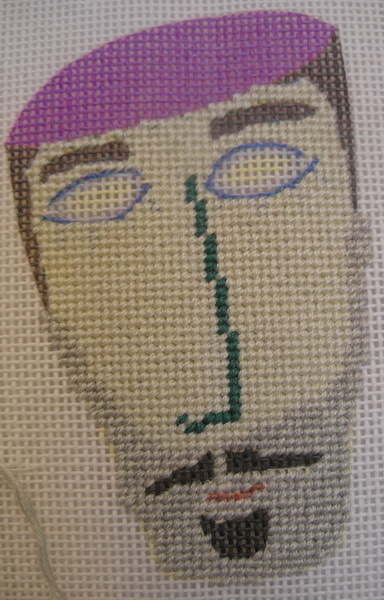 But I did read every stitch guide before I started stitching and if there was a thread or stitch I was unfamiliar with I either tried it on the edge of the canvas or on a doodle canvas I keep handy. I go in spurts doing painted canvases and most of the painted canvases I have stitched never had a stitch guide so I was on my own. 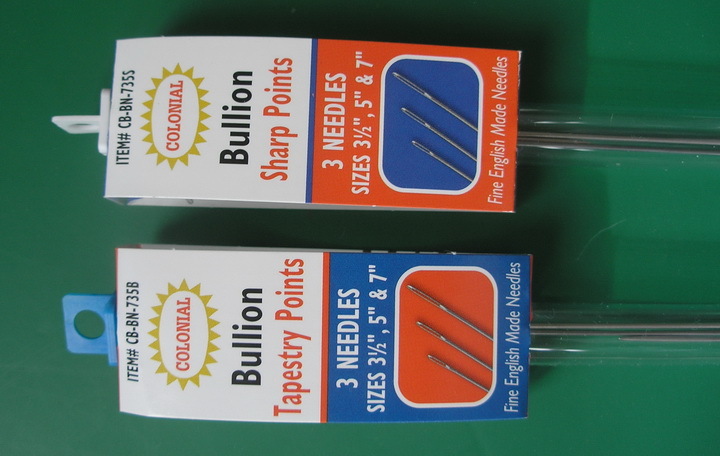 Stitch guides are a relatively new thing on the needlepoint market, they have become a big thing in the last several years. I have mixed feelings about stitch guides. 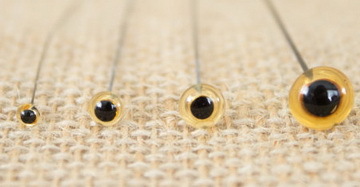 I think they are great as a guide, but please remember these stitch guides are not written in stone. If you don’t like a certain thread or stitch, then don’t make yourself miserable trying to use it or stitch it…change it. Needlepoint is supposed to be fun and THERE ARE NO NEEDLEPOINT POLICE (unless you enter a piece to be judged and then that’s a different story.) So be sure if you are buying a canvas with stitch guide and threads, be sure and look over the stitch guide first for threads you might want to substitute before purchasing all the threads. When you get home read the stitch guide and if there is a stitch you just fight all the time, then start to think of what you might stitch in its place. So if possible, you might wait to purchase the threads for the canvas later. Live with the canvas a while, read the stitch guide and check you stash for threads or threads you can easily substitute…i.e. Neon Rays for Ribbon Floss, one brand of silk for another (be sure to adjust ply and make sure color is very, very close. ) 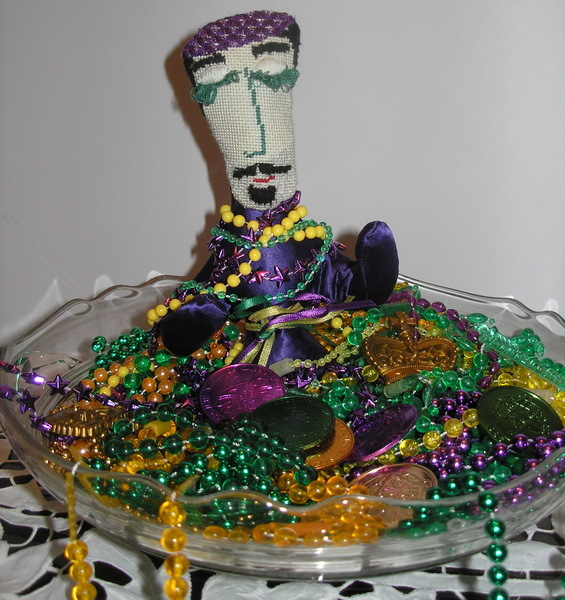 Also if there is a thread you do not enjoy stitching with, you probably have already thought of and used a substitute thread, so just see if it comes in the color you need for this project. You can also use partial skeins sometimes if the area you are stitching doesn’t call for multiple cards or skeins. I always try and remember to take pictures of unstitched canvas before I start stitching; but sometimes I forget and I only remember when I get to a place where I want to cover the painted canvas and stitch later…but I usually get a picture before I stitch too much stitching is completed. I take pictures of my unpainted canvas one of two ways and sometimes both: The difference, you ask? I use the copy machine, especially if there is an area I am going to use felt padding or need a pattern to make an applique. I use the copy machine when I want an exact copy of the design ..or almost exact copy. Copy machines do reduce your image about 1-2%, but it is usually not negligible, and a copy machine picture is much better than trying to get a photo to resize to the correct size. I use my phone or PHD (push here dummy) camera if I just need a picture to take notes about the canvas. I use this method when there is not a stitch guide and I want to make notes about the threads and stitches I use. With my camera image I can reduce or enlarge areas to suit my needs, but I still find the copy machine best if you are making a pattern of an area. 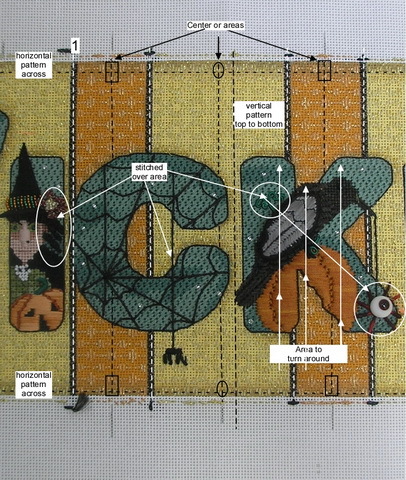 After I have an image(s) of the canvas I read the stitch guide. 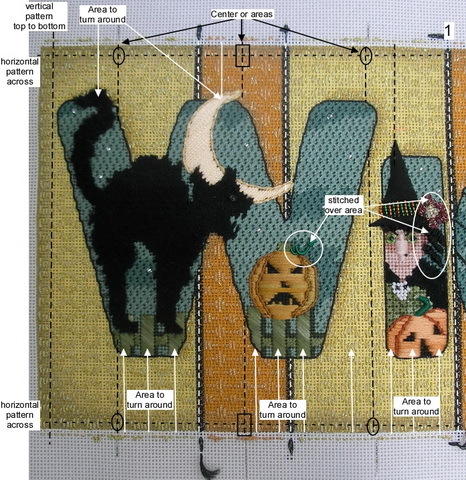 You bought a stitch guide, it is written, and you might as well read it. I also keep the canvas handy so I can refer to the areas as I read. I sometimes make notes on the image I have printed if I may want to change something or if there is something I want to look at or do before I stitch an area. and I had a stitch guide and threads. 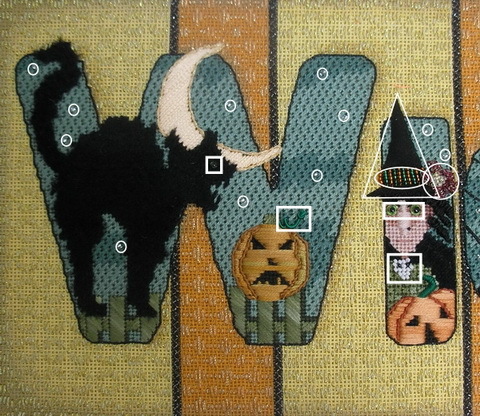 I will tell you I did not always follow the stitch guide and there were a couple threads I did not use. 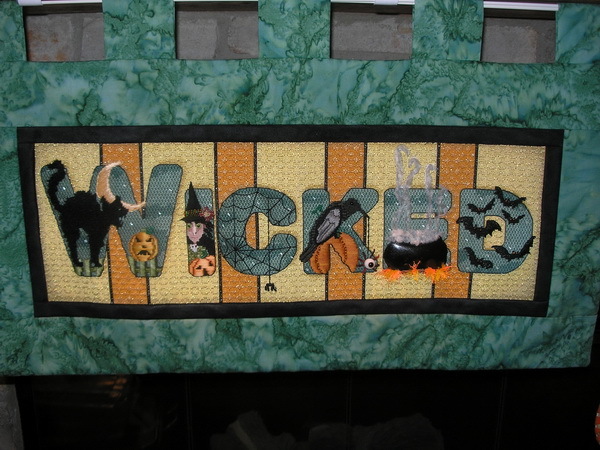 The stitch guide was a guide for me and a few places I did change or modify instructions. Wicked was a gift to me and it came with canvas, stitch guide, threads and embellishments, so I just checked my stash to use up any partial threads I might have and I did substitute two thread choices, but I didn’t do it until I was stitching the area and the suggested thread was just not working for me. I made notes on pages I had printed out for each letter as I read the stitch guide and then as I stitched each letter I also made notes on these same sheets. 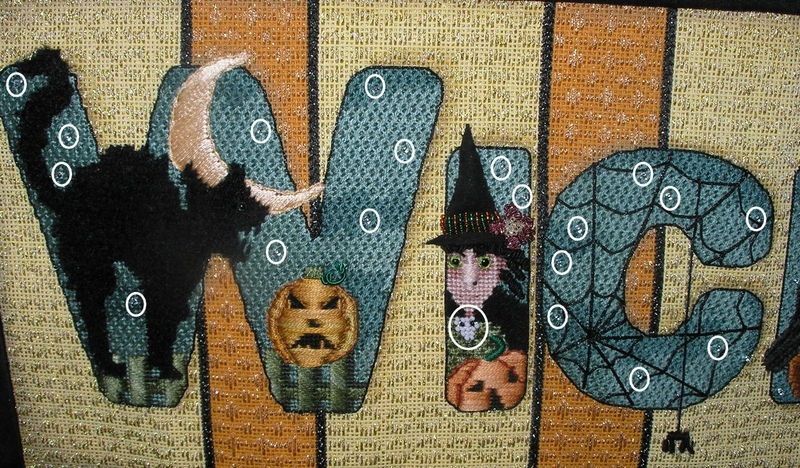 My first change was to stitch the letters in Nobuko instead of Basketweave. I just wasn’t in a Basketweave mood and I really thought Basketweave would cause the letters to recede and I wanted them to be on top of the background. 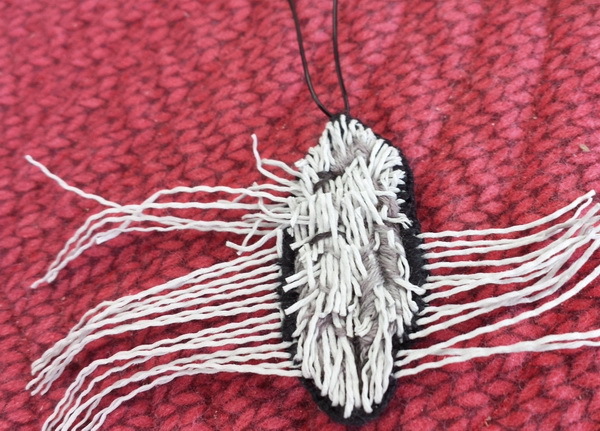 And by stitching them first, it gave me a place to turn rows of the darning background around with less difficulty and also to begin and end threads if I couldn’t get to an edge. I was happy to read that I was suppose to stitch the background as one of the first elements of the project; backgrounds can be long and boring, especially after you stitch all the fun stuff. 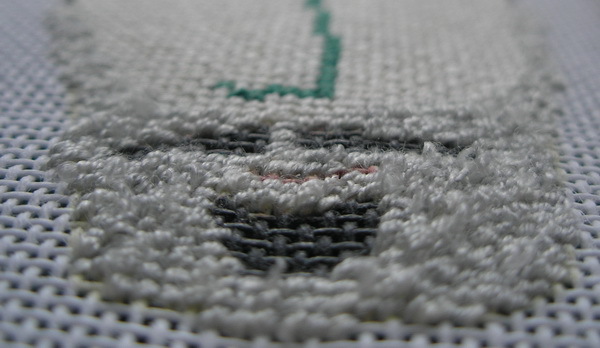 I decided to center the background darning pattern in each section; you can see my centering marks on the canvas. 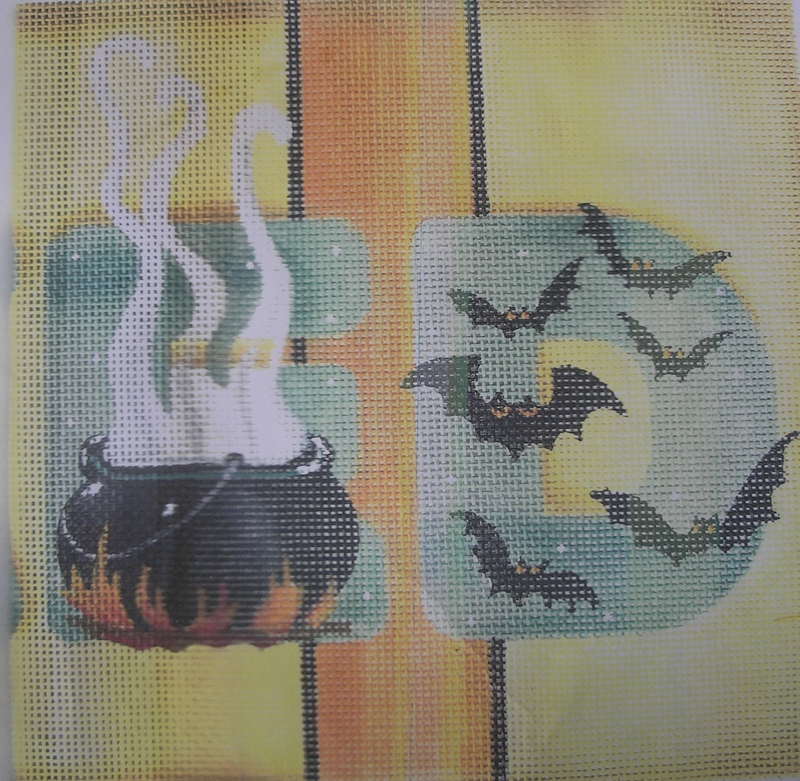 I also tried to begin and end threads for the background at the edges of the canvas using an “L” or “U” stitch. 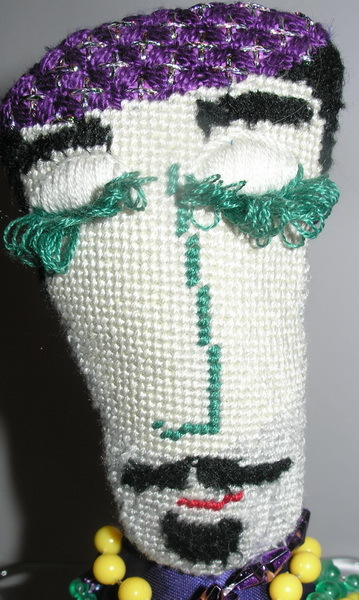 I could also begin and end threads in the letters where I stitched Nobuko. 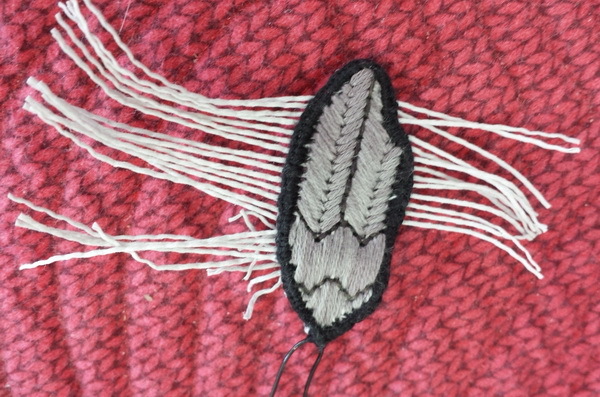 I used the Nobuko also to turn a row and keep background darning pattern thread in line. Sometimes where I knew I would be padding the canvas with felt or thread I could also make a turning stitch, but I tried to keep this to a minimum. Sometimes I had to do a small tuck stitch or carry the thread up further than I might have liked. 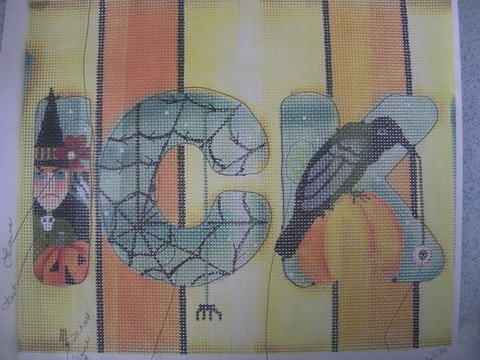 It seemed like it took me forever to get the background and letters stitched and I do think it took me about a month. 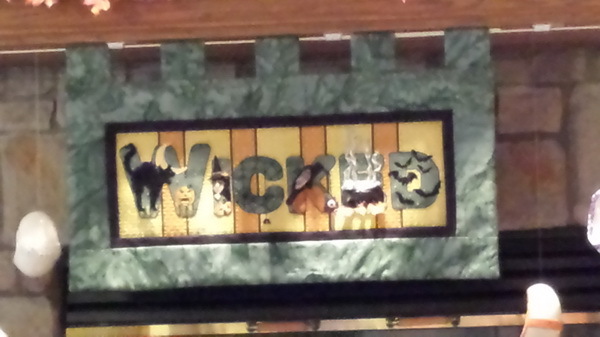 But them each letter was fun to embellish and I worked them from W to D. I’ll tell you the few things I waited until the very last to do as I tell you about the letters. I did not stitch the details of each letter until I had the letters and background complete, but I didn’t take pictures either so you’ll have to bear with me on this one. And this is about all I can write today…I think I am well over my 55 minute sitting time. So I will get up and walk and maybe I can get back to this and be a few posts ahead.